When I first heard that Sourcebooks was reprinting The Young Clementina by D.E. Stevenson, I was thrilled. I started reading D.E. Stevenson seriously last year (having only read Miss Buncle’s Book and two of the Mrs Tim books before then) and have devoured many of her novels since then, lapping up her gentle romances with delight and, occasionally, with frustration. I have had to rely on inter-library loan to read most of them so knowing that there are publishers (Persephone, Sourcebooks, Bloomsbury, Greyladies) out there now who are interested in her work thrills me no end. I had heard mixed things about The Young Clementina from other D.E.S. fans so had never sought out a copy before but now that it is readily available from my own library, I had to try it. 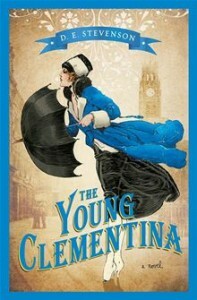 The Young Clementina is written as a first person confessional (never a favourite style of mine) by Charlotte Dean. The intended audience is her imaginary friend, Clare. While I think that is a wonderful (if misspelled) name for an imaginary friend, the having of imaginary friends by grown up women is something I am less supportive of. In her mid-thirties when the novel begins, Charlotte lives a pretty grim and pathetic existence. She works in a dull, dusty little library that specialises in travel books, lives alone in a small flat, and has little contact with her lively younger sister Kitty, who married Garth, the man Charlotte loved – and still loves, despite his awful behaviour to her. Charlotte has a slightly woe-is-me attitude towards life as the novel begins, reminding her (imaginary) confident repeatedly of how miserable she is and how she has never recovered from Garth’s betrayal. She has had twelve years to recover but instead used that time to become a hermit. Well done, Char. Over the course of the novel, much happens to change Charlotte’s life: Kitty and Garth divorce and when Garth decides to go adventuring in Africa, he asks Charlotte to come and take care of Clementina, his daughter, and run Hinkleton Manor. For Charlotte, who loves Hinkleton more than any place on earth, it is a dream come true. She still does not understand Garth and why he turned away from her all those years before after he returned from the war or why he has chosen her now to care for Clementina, but she is happy to be away from her shabby flat and tiring job, surrounded instead by pretty things and the countryside she loves. Clementina is a sober child, affected by her parents’ warring ways, but in their absence she too starts to blossom. When first Kitty and then Garth die, it is upsetting but Charlotte and Clementina carry on through the next few years, finding solace in each other and in friendship with their neighbours. The “surprise” ending is as unsurprisingly as you’d expect; if an object of romantic attention is sent to an exotic location and “dies” without a body ever being found (lions seem to be useful this way), hint: he is not actually dead. He is never dead. (Unless you are reading an O. Douglas novel, in which case good luck recovering from the shock of not being double-crossed by your author.) The “mystery” of why Garth went from attentive lover to cold, cruel brother-in-law is equally obvious, unless you are Char, who has spent the last twelve years wondering about this without ever having asked Garth or Kitty directly what happened. Even more frustratingly, the dialogue is as cliché-filled as I’ve ever encountered in a D.E.S. novel, which is saying something. The Young Clementina is a pleasant romance, if frustratingly clichéd and in possession of a singularly irritating protagonist. But I have now read almost thirty of D.E. Stevenson’s books and know she can do so much better. For the life of me, I cannot understand how publishers have chosen the titles that have recently been reprinted. D.E. Stevenson was a prolific author and wrote dozens of enjoyable but mediocre novels and only a handful of really good ones. So why are the mediocre titles (like The Young Clementina and Miss Buncle Married) being reprinted while the better novels languish forgotten? Why not The English Air? Why not Sarah Morris Remembers? Why not Amberwell, or The Blue Sapphire, or Listening Valley? And why oh why not more of the Mrs Tim books, only the first of which has been reprinted in recent years? I shall have to be patient, I suppose, and just hope that in time these books will also be reissued but the wait will be frustrating. I loved The Young Clementina, and it was a perfect escape read for me recently, but you identified all the annoying elements absolutely bang-on. I am only part way into my exploration of this author, but I’ve found it necessary to tightly rein in my innate readerly cynicism and just GO with it and swallow everything with happy suspension of disbelief. I too am hoping that we see much more of her work republished. and I too will throw in my vote for Amberwell as one that deserves special recognition; it was excellent. I was feeling a bit snarky after I finished this last night and tried to channel that when it came to the review. It certainly entertained me to write it and I’m glad you found it amusing too! And I still haven’t recovered from reading The Proper Place.